One of the ever-present issues in 2017 is the debate surrounding marijuana decriminalization and legalization. As support for marijuana increases nationally, legislators have been forced to respond by modernizing their positions. 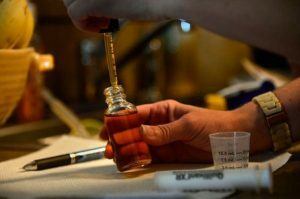 Republicans used to be united in their opposition to drug legalization, but it has become a divisive topic in the conservative ranks, especially with more Libertarian-leaning Republicans like Senator Rand Paul calling for an end for the war on drugs. Democrats have already been in favor of marijuana reform for some time, due to known racial disparities in arrests and what is seen as an misappropriated use of police resources away from violent crime. Ralph Northam, the Lieutenant Governor of Virginia and current Democratic nominee for Governor has come out much more in favor of marijuana reform than his GOP counterparts, although not as progressive as his primary election opponent Tom Perriello – according to a report card released by The Marijuana Policy Project (MPP). Nonetheless, according to the MPP report card Northam’s Republican opponent Ed Gillespie, scored a solid D, while he received a respectable B only falling short of Perriello due to a lack of detailed responses to the whole questionnaire. Based on statements made by Northam, his understanding of the issue is not just predicated on his experience as a medical doctor, but also in acknowledging the disproportionate arrest rate of African Americans at a rate of almost 3 to 1. Despite this, planks related to marijuana decriminalization don’t appear anywhere in the issues section of his campaign website, and it appears that this statement is one of a very few on drug policy. However, understanding how decriminalization and the reform needed to implement it works, requires a deeper understanding of the issue beyond just campaign talking points. In April, Virginia’s State Crime Commission agreed to undertake a study that assesses weather Virginia should decriminalize small amounts of marijuana. The Virginia branch of the National Organization for the Reform of Marijuana Laws (Virginia NORML) is based in Richmond and has been one of the most stalwart proponents of marijuana legalization for decades. 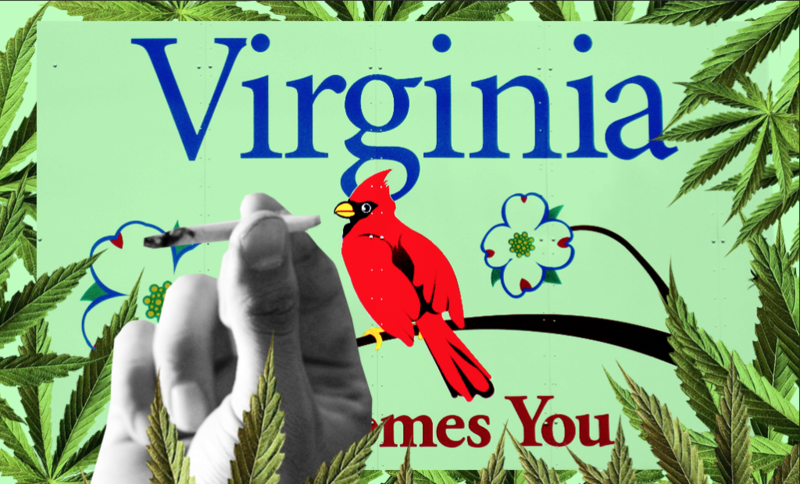 Yet Jenn Michelle Pedini, executive director of the organization, believes that Virginia is making progress on marijuana reform, although slowly. 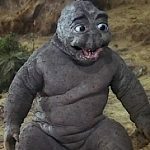 In March of this year, Gov. Terry McAullife signed two marijuana reform bills, one which allows discretion in suspending people’s drivers licenses who are caught with small amounts of drugs, while the other allows pharmaceutical companies to manufacture and produce cannabidiol oil and THC-A oil to treat epilepsy – a first step towards potentially legalizing medicinal marijuana. The racial dynamics of how marijuana enforcement is implemented throughout law enforcement also remains a priority for NORML. 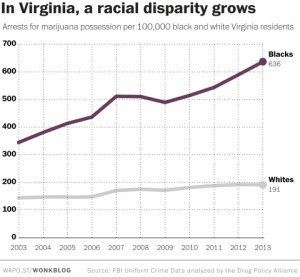 Similar to the viewpoint of the Democratic candidates, Pedini addressed the disparity in arrests despite it being well known that people of all races use marijuana at equal rates. This is tied to a history of housing discrimination that has confined low income people and communities of color to certain areas. He further described a situation in which police will often wait outside of these communities and wait for people to come outside and smoke marijuana, allowing them to be easily targeted. Cindy Cutler, a prominent leader of Decriminalize Norfolk, has always had an interest in criminal justice reform and has been with the organization for almost two years. After reading some articles in the Washington Post and Huffington Post, she discovered that Norfolk had one of the highest arrest rates in the country for people of color. Speaking with Norfolk Sheriff Joe Baron, she found that all but five out of 86 of the inmates in Norfolk arrested for marijuana possession were African American. When she brought this up to Mayor Kenneth Alexander, he promised to work on marijuana reform with her. “[Alexander] invited the Speaker, Senator Norment to their annual legislative dinner last year, and that’s where he made a statement [supporting decriminalization],” said Cutler. She said that her organization has 100 percent of the City Council’s support. Cutler supports Northam’s campaign for governor and his policies on marijuana reform. Cutler recounted Northam’s background as a physician and the first of the gubernatorial candidates, including the Democratic ones, to champion the need for doctors to recommend medical cannabis. She sees this as proof of him knowing what he is talking about and his dedication to working for decriminalization. On the other hand, she sees Gillespie as being a step backwards on drug policy. *David Pettyjohn and Landon Shroder contributed to this article.